It might be a whole new build, or just a new circuit. Whatever the job, we guarantee a high quality installation. You can't put a price on the peace of mind that comes with having excellent business security. We offer a range of highly sophisticated CCTV systems to keep your premises safe. We fit state of the art, power-efficient lighting. We can also install appropriate emergency lighting. Every employer must make reasonable adaptations for the disabled under the Equality Act 2010. We can provide hearing induction loops, as well as a wide range of mobility solutions. All commercial premises are legally obliged to fit a fire alarm. We offer a wide range of alarms to ensure optimum safety for both staff and customers. We can provide both conventional and addressable systems. We will install and maintain your telephone and data points. This is critical to ensure you'll never lose business when people can't get in touch. 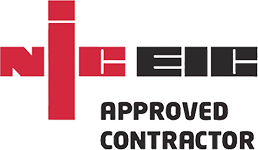 We are a NICEIC approved contractor, qualified to conduct PAT testing and run periodical test reports. All our electricians are experienced professionals with full DBS and CRB clearance. This allows us to work with and alongside vulnerable people.We can provide contractors for schools, hospitals, care homes and other establishments.